Hyperpolarization. More than a quarter of a century ago, physiologists identified an electrical current in neurons and cardiac myocytes that behaved so strangely that it was called the “queer” or “funny” current: it paradoxically caused depolarization upon hyperpolarization. This current was finally named h-current and is mediated by HCN channels. The h-current has been associated with epilepsy through functional studies, but a genetic link has been elusive so far. In a recent publication in Nature Genetics, de novo mutations in HCN1 are identified in patients with early-onset epileptic encephalopathies resembling Dravet Syndrome. H-current. The HCN1 gene is best introduced by the mechanism that it is involved in. Neurons have a negative resting potential that is only interrupted when information is transmitted by the means of brief depolarizations. The h-current has perplexed researchers, as it apparently counteracts the otherwise stable negative membrane potential. Once the membrane potential becomes negative, the h-current kicks in, leading to depolarization. When the membrane potential is subsequently shifted to more positive values, the h-current subsides. This back-and-forth may lead to an oscillation that is thought to underlie the pacemaker function of cardiomyocytes and some neurons. In addition, the h-current probably has some stabilizing and filtering properties. For example, dendrites are increasingly equipped with HCN channels the further away a particular dendritic segment is from the soma. The h-current is thought to contribute to the fidelity of the excitatory postsynaptic potentials (EPSP), which are subsequently integrated into action potentials. And there is plenty of evidence that the h-current is dysregulated in epilepsy, most prominently in mouse models of Febrile Seizures. The HCN1 study. Nava and collaborators identified two de novo mutations through trio exome sequencing. Four additional mutations were identified in a follow-up cohort of 157 patients, resulting in total of five de novo mutations and one variant for which parental DNA was not available. This provides strong evidence from the genetic data alone that these mutations are causative and not chance findings due to the huge variation in the human genome. Also, in parallel to CHD2, GABRA1 and STXBP1, mutations in HCN1 might be a recurrent cause of SCN1A-negative Dravet Syndrome. 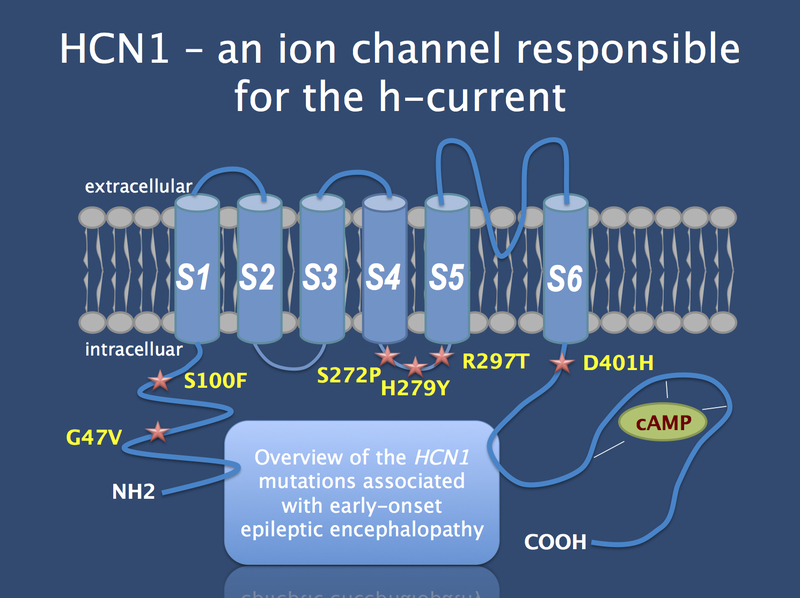 Schematic of the HCN1 channel with the protein alterations caused by the mutations identified in patients with Dravet-like epilepsy. In 5/6 patients, the variants were confirmed to be de novo. When studied functionally, some mutations lead to a gain-of-function while other mutations results in decreased channel function. The phenotype of patients with HCN1 mutations resembles Dravet Syndrome with an unusual progression into atypical absences and autistic features (non-copyrighted preliminary version of figure provided by author). A Dravet-like phenotype. The phenotypes of the patients with de novo mutations in HCN1 resembles Dravet Syndrome, even though there was a predominance of atypical absences, intellectual disability, and autistic features. While the phenotype resembled Dravet Syndrome initially, the progression of the disease was different. While the current publication already indicated that a more detailed phenotypic description will follow, the publication by Nava and collaborators already emphasizes an important point: not only are we in the process of understanding the genetic basis of SCN1A-negative Dravet Syndrome, but there are possibly also novel, distinct phenotypes associated with these genes. The mystery continues. The study by Nava and collaborators provides solid evidence that primary alteration of HCN channels can results in severe human epilepsy, indicating that alterations in the h-current observed in epilepsy may in fact be causative, not only compensatory. The mechanism linking h-currents to epilepsy has perplexed scientists in the past – the precise mechanism remains elusive despite the genetic evidence provided by Nava and collaborators. The authors demonstrate that some mutations have a gain-of-function effect, whereas channel function may actually be reduced in other mutations. In addition, some structural genomic variants deleting parts of the HCN1 gene are found in control individuals. This suggests that simple haploinsufficiency is insufficient to explain the pathogenic effect. In summary, the functional effects of Dravet-related HCN1 mutations is striking, but diverging. There does not seem to be a simple answer on how h-current alterations lead to epilepsy. Lessons learned. HCN1 is a novel gene for epileptic encephalopathies identified through trio exome sequencing combined with follow-up screening. The case of the HCN1 gene demonstrates that sufficient genetic evidence can also be found for epileptic encephalopathy genes that may be affected by duplications or deletions in unaffected individuals. Also, the study by Nava and collaborators shows that concepts established through functional studies may eventually be corroborated through genetic evidence in the era of large-scale genetics. Disclaimer. I am a coauthor on the current publication by Nava and colleagues through the contribution of the EuroEPINOMICS-RES consortium. In the case of the current publication, the EuroEPINOMICS-RES consortium contributed one of the patients with a de novo mutation and provided a platform for putting the data from different research groups together. This entry was posted in 2014, autism, Epileptic encephalopathy, EuroEPINOMICS, Papers and tagged action potential, atypical absences, autism, Dravet Syndrome, epileptic encephalopathy, febrile seizures, funny current, h-current, HCN1, HCN2, intellectual disability, queer current, resting potential, SCN1A. Bookmark the permalink.